Well, some remember Malachi Martin from years prior to 1999, when he met death in what some called, a supernatural attack…! Prior to 1999, Martin had written a number of books related to the Catholic Church and appeared on Coast to Coast AM with Art Bell in some very unprecedented interviews relating to the End Times and what some insiders of the church and outsiders were looking for, 1 sign being in the cosmos, heaven…???? As a matter of fact Art Bell did two things that were remarkable to me: 1 being Art’s refusal to discuss any part of Stewart Best’s “Project RedStar” DVD presented to him on the air LIVE by John Lear and 2 refusing to release secret ‘data’ given him by Malachi Martin just before Martin died so mysteriously…! However, Art Bell did refuse to release Martin’s secret data and in a short time, was no longer ‘on the air’ and off radio…???? Malachi Martin at times embedded into his books some incredible DATA, prophetic ? Or just he knew ahead of time where things on planet Earth were going, with the human or the called ‘Adamic Race’…? One such book of 734 pages was THE KEYS OF THIS BLOOD, by Malachi Martin, also author of THE JESUITS and THE FINAL CONCLAVE…! I will not try to interpret this data by Malachi Martin, however; the cosmos event that the ‘powers that are’ try to COVER OUR EYES from will probably be seen/witnessed by all..! And I finally watched “Splice” verrrry very creepy! In particular the scene in the old apartment after the seduction (which I had to skip forward!!!!! Couldn’t look….like a kid at a scary movie) where the couple seem to be one last time in Eden discussing their new knowledge of good and evil and also the scenes where the creature sprouts demon angel wings! The metaphors are truly haunting! Even the opening credits gave me shivers and for some reason since I saw it after the Japan quake, reminds me of that fish on you tube! Gonna go find it again and post here. God bless and keep you both! scifi movie with Steve McQueen, THE BLOB….???? All that mass of red, gooey stuff! Are we talking about a book or a movie? Not sure. 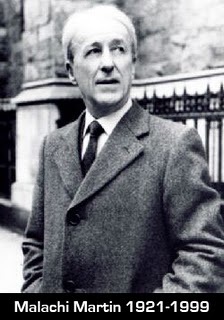 I had some correspondence with Malachi Martin, at the time I was still attempting to be a Catholic. I told him about some of the anti-pope activity and occult and odd happenings in the diocese where I lived at that time. He wrote back, expressing shock. Several times we corresponded and it seems he must have had several people who wrote in similar manner. Not long before his death his secretary wrote to say he was very sick and could not correspond any more. It is very mysterious to me, even knowing him a little in this way, what the non-reportage concerning that interview with Art Bell was. I think it had something to do with the Secret of Fatima, which has been released in false form more than once, according to the Catholic website which can be googled under “These Last Days” or “Bayside apparitions.” It is a secret within a secret. I still have no idea what the Secret of Fatima is, but various reports say it has to do with apostasy in the Church. Eveidently too shocking to be revealed, although I cannot see any reason why apostasy in the Church should not be discussed by the Vatican, which is aware of such things. Perhaps they do not want to”scandalize the faithful.” there is lots of info on the internet about the false Secret of Fatima, but you won’t gain much by trying to read it. New Mexico weather & earthquakes……! MAN’S RELIGION IS JUST THAT NOT OF THE LORD BUT OF SATAN . IF YOU DO NOT EXCEPT JESUS FIRST ,STAY AWAY FROM THE BIBLE YOU WILL BE MISS- LED ONLY PUTTING THE LORD FIRST CAN YOU FIND TRUTH .THE CATHOLIC CHOSE MAN’S WAY ,AND WILL FALL TO HELL AND DAMN-NATION,AS OTHER CHURCHES. THE BIBLE IS LIKE DIRT WITH NO SEED NOTHING CAN TRULY GROW FROM IT AMEN AMEN AMEN,YOU MUST HAVE JESUS FIRST AND FOREMOST .MY THOUGHT ON PAGAN RELIGIONS . oh Larry you need to watch the new movie Rise of the Planet of the Apes and see what they have in store for us.At the end of the movie they let loose a virus that spreads across the globe. Larry, sounds life the “sign” of Malachi Martin is what we call Gods’ WARNING to the whole world. Quoting one seer, ” Signs will appear in the sky first_ the sun will spin like never before. Then you will see the CROSS just before stars clash in the skies. Then My Rays of DIVINE MERCY will cover the earth.” This is due to happen soon… Check out courlisius.org and What is new there. Julie, the site is also in Dutch. Just click on English. It must be possible. Thank you so much Larry. I always learn so much when I read your posts. May the Lord protect you and your family. God Bless!! I have read a lot of Malachi Martin’s books. In fact, some have suggested he was the model for Father Phillip Lamont (played by Richard Burton) in the movie “Exorcist II: The Heretic.” Much of the information from that movie came from Fr. Martin’s book Hostage to the Devil written back in the 1970s. The critics hated the movie, but it told an interesting story. The most interesting book he ever wrote though, was Windswept House, published just before he died. I too, had some communication with him, as I wanted to know the source for some of his information. He always replied in a timely manner and willingly shared his sources. He blamed his publisher for the lack of footnotes. Tom Mack, my long-time friend ~~~~ Thanks for sharing that with us!